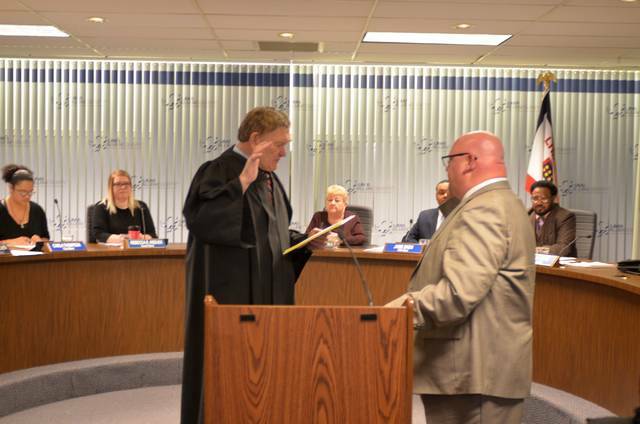 LIMA — Four city council members were sworn in at the Lima City Council meeting Tuesday night, three of whom are stepping into the role for the first time. Todd Gordon, of the 1st Ward, Carla Thompson, of the 3rd Ward, Jon Neeper, of 7th Ward, and Jamie Dixon, of the 5th Ward were sworn into office as the meeting began. Gordon, who was re-elected, said that it was a great feeling to be back on council and looks forward to accomplishing more during his second term. During this term, his focus will be on developing better neighborhoods. Thompson said she will focus on landlord registry that works for both citizens and for landlords, as well as helping the youth. Dixon said that his excitement began on election night when he realized that he had won, but nothing compared to being sworn in. Quality of life, safety for neighborhoods, dilapidated homes and youth development are all issues that he hopes to address this term. He hopes to prevent issues like the incident that happened at Waffle House on New Year’s Day. Neeper said that being sworn in Tuesday was surreal because he did not imagine that night approaching as quickly as it had. During his term, he hopes to resolve the crime and drug issue, which he believes will help attract more people to the city.